It all started with a Snoopy drum set. At the ripe old age of 6, Benj LeFevre had his first on-stage musical experience playing that drum set along to a record in a school talent show. After much critical acclaim, and notoriety with his classmates in the schoolyard, Benj caught the music bug. It wasn’t until the age of 11 that Benj began his real musical journey. Starting out on the trumpet, Benj spent his middle and high school years learning music, playing in the various school bands, and trying to get the attention of the girls. When he realized that they were not interested in a trumpet player, he quickly switched over to the real chick magnet, The Bass!! All kidding aside, at around age 18, Benj developed a serious desire to learn the Bass. Trumpet was great, but the bass was having a real pull for Benj. Armed with his first bass, a Cort P-Bass copy, Benj was off and running (and walking)! Listening to as much music as possible, Benj soaked up all he could from the artists he was exposed to. Whether it was Led Zeppelin, The Who, AC/DC, Beatles, to the pop stars of the time, The Police, Talking Heads, Benj honed in on the bassists, how their bass lines were constructed, and how they fit the particular song. Soon after Benj would branch out and start delving into all of the old Soul, R&B, Blues, Funk, and Reggae he could find. Having a musical base already from the years on trumpet enabled Benj to get a quick handle on the process of learning the bass, and in no time Benj was jamming with local musicians. Benj began taking private lessons with some great teachers, and this helped in learning bass theory, and making that great transition from Treble to Bass Clef! 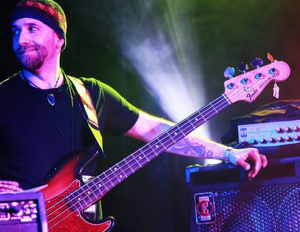 Once Benj had gained some control of the bass, some of the area bands began to take notice, and Benj spent many years playing with some of the areas best bands. Each time Benj would get into a new group, he was fortunate to be able to be amongst players that were well accomplished, and Benj learned a great deal about playing live music, as well as all the dynamics of playing in group situations. Benj’s style of playing can be best described as groove oriented and rock solid, some of his nicknames include “The Rock”, “Sheriff Low Notes”, and most recently, “The Harbinger of Boom!! Benj loves to sit in the pocket, setting up unwavering bottom, so that the rest of the band can do their thing on top of the bass and drums. One of Benj’s favorite influences is Donald “Duck” Dunn, who was a master of staying in the pocket, without any overplaying; always playing the right bass line for the song. There are many other influences, too many to list; all of Benj’s favorite bassists share a common theme, and that is groove! 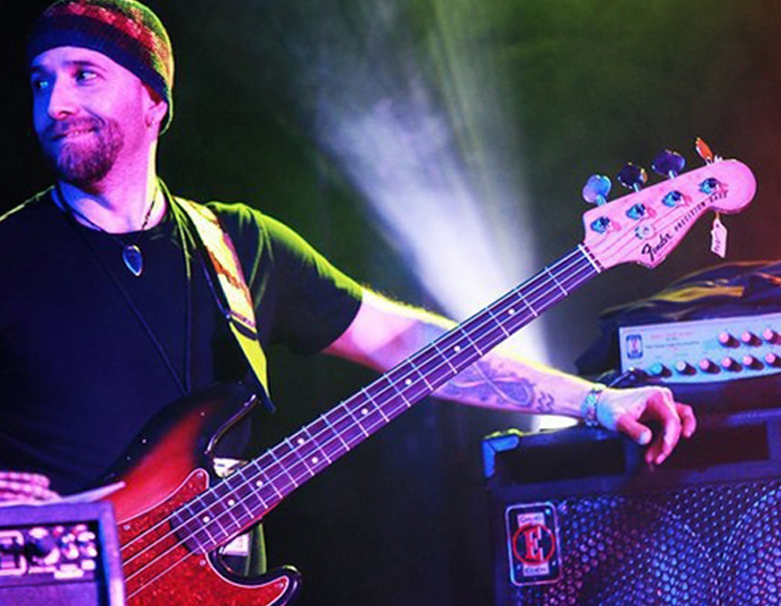 Benj is a founding member of the Northeast Funk/Rock band Deep Banana Blackout, a group that started out in 1995, and toured the US and overseas for many years. DBB developed a strong cult following due to the high energy Funk, Soul, Jazz, and Rock they blended. DBB had varied musical influences, and many of those same artists shared the stage and played with DBB, including Maceo Parker, Clyde Stubblefield, and Fred Wesley (James Brown), Warren Haynes, John Scofield, Derek Trucks, Michael Ray (Kool & the Gang, Sun Ra), Rebirth Brass Band, George Porter and Leo Nocentelli (The Meters), Chris Frantz and Tina Weymouth (Talking Heads, Tom Tom Club), to name a few. Benj is a freelance bassist, currently based out of Connecticut, and is available for touring, recording, and private lessons.